We continue to see so many new releases in JAFF that I feel some authors are just unstoppable! One of them is Jennifer Joy whose debut book, Darcy’s Ultimatum, was released in March 2015, and who has released since 5 other books! And guess what? She didn’t stop there and I’m happy to announce that she will release her 7th novel on June 23rd. Impressive right? Today I bring to you the blurb of Win, Lose or Darcy and reveal it’s cover! It’s the second cover reveal I’m doing for one of Jennifer Joy’s books, and the first cover I revealed, Accusing Elizabeth, remains one of my favorites! Fortunes may be won or lost, but there is only one Mr. Darcy! Mrs. Bennet wins the lottery! When the battle ensues over how to invest their new wealth, Elizabeth Bennet sees an opportunity to reunite her heartbroken sister with Mr. Bingley in London. Once in town, Elizabeth befriends Miss Sophia Kingsley, a highly influential young lady in the beau monde, and soon finds herself in the midst of a society intolerant of her family’s improprieties. Fitzwilliam Darcy is drawn to Elizabeth Bennet’s charming wit— despite her appalling family. But with the Season fast approaching, the competition to win Elizabeth’s affection intensifies as Mr. Gerard Gordon makes his intentions clear. Will Mrs. Bennet´s gambling and Mr. Bennet’s indolence ruin Elizabeth´s chances of love and happiness before the London Season begins? Will Mr. Darcy overcome his pride and the manipulations of his friends in order to marry the woman of his choice? Win, lose, or draw, our dear couple finds their happily ever after… we hope. *This is a light-hearted, sweet romance based on Jane Austen’s Pride & Prejudice. 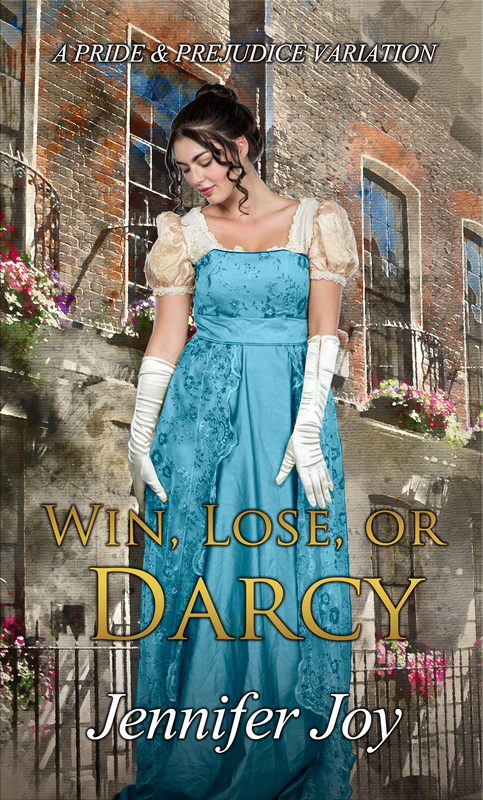 Apart from the cover, Jennifer Joy brought to From Pemberley to Milton four e-book copies of Win, Lose or Darcy to offer to our readers across the globe. The giveaway is international and to participate all you have to do is comment this post by sharing your thoughts on the blurb, the cover, or Jennifer’s previous books. If you want to double your chances of winning, you can also comment on the excerpt we will share on the release date! Don’t forget to stop by, learn more about the book and double your chance of winning. Congrats, Jennifer. Thanks for posting, Rita. This is a lovely cover and I, personally, believe this is her best story. I LOVED this Darcy and Elizabeth from cover to cover. I love the blue dress on the cover! Thank you, Patricia! We had to change the color to make the title pop and… I love blue! what was the original color? love the cover and this seems like a great book to start off the summer! Thanks for the blurb and the giveaway! There’s an excerpt (which you’ll see Thursday) that should cool you off on a hot summer day! Thank you, Theresa. Jennifer, I don’t know how you keep coming up with all these ideas for stories, but I’m glad you do! Looks like another fun read. I love the blue dress on the book cover! Thank you, Maureen! I just hope that the ideas never stop coming! I’m so glad you love the blue dress. The story starts off at the Netherfield Ball with all of the unfortunate misunderstandings having taken place beforehand. (The Meryton Assembly… yikes!) As for the rest, I hope you win so you can find out! I will be reading this as I have enjoyed all her other books. Yes the cover is just lovely and the story sounds intriguing. Good luck with the release. I hope it’s as fun to read as it was to write! Thank you, Jennifer! I’m just delighted to learn that Mr Gerard Gordon is making his intentions clear!!! There’s nothing like a little bit of jealousy to spice things up!! It serves to give certain people a decided purpose and ‘encourages’ them in deciding what they want in their future,and,more importantly,who they want in they future! Sounds like a wonderful story!! Thank you, Mary! It’s always fun to see how Darcy and Elizabeth react when new characters are introduced! I’ve been lucky enough to have a sneak preview of this at the beta stage and as others above have surmised, it’s a really fun read! The cover is lovely, Jennifer, and I’m wishing you all the best for the launch. What would I do without you, Anji 🙂 Thank you for keeping my vocabulary truer to period! As always I look forward to reading your new releases! Love the color of the dress on your cover. I hope you like this one, Jessie! After dealing with death and mourning in Love Never Fails, I wanted this book to be fun! We’re getting a jump start on release day (June 23rd) by posting this cover reveal today, and then a rather long excerpt on Thursday! I loved writing this Darcy so much and was heavy-handed with the HEAs. Thank you for your kind words, Janis, and best wishes to you! Well this is exciting news! Like others above, I love your books and look forward to the ‘drama’ of Mrs. Bennet winning the lottery and the chaos that invokes! I also like to see a bit of competition for Elizabeth’s affections! Let the games begin! Lovely cover! Let the games begin, indeed! Money and Mrs. Bennet just don’t mix well 😀 Best wishes to you, Carole! Thank you, Glynis! I think you’ll like how our dear couple end this version of their story. Mrs. Bennet wins the lottery? Now that’s a variation I haven’t read before. It sounds fantastic! I hope you enjoy it, Anna! Thank you! It certainly is exciting for Mrs. Bennet and the girls 😀 Best wishes to you, Amy! I think my favorite of Jennifer Joy’s books so far is Accusing Elizabeth.It’s such a great whodunit, and I was really surprised with the solution to the mystery! I’m looking forward to reading her latest. Thank you for this giveaway! Thank you for your kind comments, Nicole! Best wishes! Oooh what an exciting blurb! Can’t wait to read this book. Thanks for the giveaway! Yay! I’m so glad you liked the blurb. It took me an entire week to write 😀 Thank you, Priscilla! Sounds like another good read from Jennifer. The cover is so pretty. Oh, that Mrs. Bennet. I wonder if Mrs Bennet loses the lottery money to gambling… I am sure Mrs. Bennet will be worse than ever. I know there will be an HEA, thank goodness. Looking so forward to reading this story. Thank you, Deborah! Mrs. Bennet sure does provide some great conflict 😀 And yes, there is most definitely a HEA. Several of them, in fact! Nice cover. I look forward to getting a copy of your new book. Thank you, Gianna! Best wishes! What a sweet, bashful model and fits what I’d imagine of an Elizabeth suddenly thrown into the higher circles of society like in this story. I’m intrigued by the premise, too. Thank you, Sophia! Sweet models are hard to find, but I think that the one on the cover does our Elizabeth justice. Congrats on your newest, Jennifer! I can’t wait to read it! Love the cover. That blue dress is lovely! Thank you, Pam! It’s always so exciting to complete a novel… and share it! Love the color of her dress on the cover!! Thank you for the giveaway!! Now you know my favorite color 😀 Thank you, Literary Chanteuse! Oh joy, Joy! Cannot wait for your new story. Love the beautiful cover. Hard to tell exactly what color, but it looks turquoise. Love it! Haha! There’s a lot of joy here today, Carol! It is hard to define that color… somewhere between turquoise and teal? Thank you for commenting! On joy, Joy! Beautiful cover, I love the color of Elizabeth’s dress. Cannot wait for the book. Wow, I can hardly wait. The cover is beautiful, and the idea is intriguing. I know I absolutely loved the book, Accusing Elizabeth. I liked the others too, but that one I remember her really well, as I lost a lot of sleep over that one. It had a great cover and great story. This idea sounds like a real winner if only things will work out for Elizabeth. Beautiful cover! She looks very close to how I imagine Lizzie in my mind. The blurb definitely has me intrigued! I can’t wait to read this! Thank you, Candice! I hope you enjoy it! Aw, thank you so much! I hope you enjoy this story as much as the last! Wonderful cover! With you being such a wonderful storyteller it must be a great story. I hope to get lucky but just in case I will be sure to add it to my wish list! Love Jennifer’s books. This is a must read for me. Thank you, Becky! I hope you enjoy it! Congrats on your newest release! Love the color of the dress on the cover! Excellent, sign me up. Jennifer Joy writes such sweet tales. Congratulations, Jennifer Joy, on the 7th book! What a wonderful cover!!! Can’t wait to read this as I’ve really enjoyed your previous books! Thank you, Lynn! I hope you enjoy this story as much as the rest! I’ve only read one of your books so far, where have I been?? It sounds like I’m missing some great stories, can’t wait to catch up! Gorgeous cover, I want that dress! There have been so many wonderful books released this spring/summer, it’s difficult to keep up! Best wishes to you, Kim!